Bible teaching, preaching, music, drama, news and more! < Pictured at the left are Rolen and his father in front of their apartment in Atlanta, GA.
Rolen Cornelius was born in Atlanta, Georgia, in 1933. He was a fun-loving boy often getting into mischief - like the time he ate all the tootsie-rolls that his mother bought to give the children at his birthday party! Reared in a Christian home, Rolen accepted the Lord Jesus Christ as his Saviour at a very early age and grew up desiring to serve the Lord anywhere God chose. 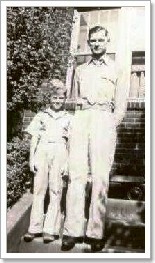 He is pictured here at about age 10 with his father on the steps of their Atlanta apartment. To prepare for God's service, Rolen enrolled in Bob Jones University in the fall of 1951. "Rolen graduated from Bob Jones University in 1955 with a Bachelor of Arts degree in Practical Christian Training. Instead of a minor, he took two proficiencies – one of which was radio production. He never expected to use that knowledge, but was just interested in radio. He became interested in the Sudan Interior Mission board through a missionary from his home church who was doing translation work in the Sudan. The Sudan Interior Mission sent a representative to BJU while he was a student to recruit new missionaries for Africa. He applied to the SIM to serve in the Sudan with his missionary friend, doing translation work. He took a course in linguistics during the summer and went to New York to participate in the six week mission candidate school that fall." Pictured at the left are Rolen & Arlene after their engagement at BJU. 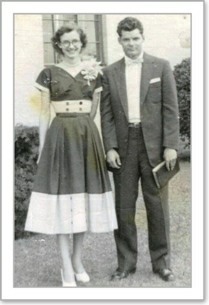 Rolen was engaged to E. Arlene Cornelius in the spring of 1955. "I had two more years to complete my major in Practical Christian Training at BJU. 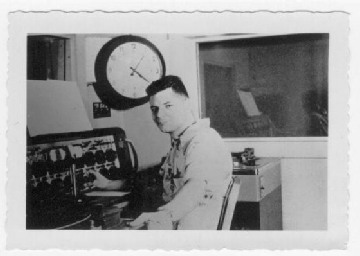 One morning in chapel, an announcement was made for those interested in doing volunteer work at the school’s radio station, WMUU, to go to the station and apply. Somehow the Lord impressed on me that I should go and apply for that job. All the way to the station that afternoon I was “protesting” to the Lord that I didn’t plan to go into radio work, so I didn’t understand why He was sending me there. I was given the job of helping Mrs. Barbara Rumminger in the music library, checking music and planning music programs. After awhile, the school administration told me that I could no longer work at WMUU on a volunteer basis because I was a “work-loan scholarship” student. If I stayed there, they would have to pay me. I went to Mr. Jim Ryerson, the station manager and explained the situation and he agreed to start paying me for the work since they wanted me to stay there at the radio station with them. Pictured at the left is Rolen at the control board at ELWA in 1960. Meanwhile, at the SIM candidate school in New York, a film was shown to the missionary candidates about a brand new missionary radio station which went on the air one year earlier in Liberia, West Africa. As soon as Rolen saw that film he got excited! He knew that God was calling us to serve Him there at ELWA. He wrote to me at BJU in South Carolina, telling me about ELWA and that he believed that was where the Lord wanted us to serve Him. Our letters crossed in the mail! This was the Lord’s confirmation to us: “This is the way, walk ye in it!” Isaiah 30:21. Rolen went on to Liberia while I finished school and two years later, in 1958, we were married at Radio Station ELWA in Liberia, West Africa. 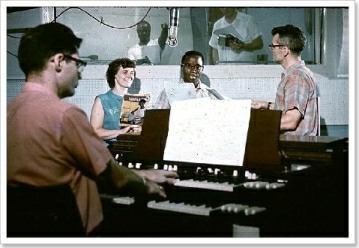 We joyfully served the Lord together in the radio ministry there for 14 years. All four of our children were born in Africa: Becky, Randy, T ony, and Jonathan." Rolen was involved in many aspects of the work at ELWA. He maintained radio towers, managed the "traffic" (programming) for 5 control rooms where the Gospel went out in nearly 40 different languages! He was the station organist, playing for church, special occasions and most notably, dramatic recordings. He eventually became Director of External Affairs managing several recording studios in Africa and the Middle East. "In 1972 our family left Africa and the mission with which we had been affiliated, because of the compromising situation which had developed there. 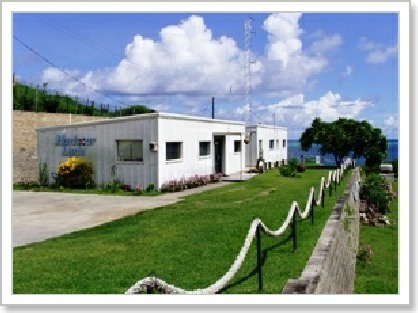 We were led of the Lord to establish the Caribbean Radio Lighthouse on the island of Antigua, which went on the air in September of 1975. Rolen was the director of ‘Radio Lighthouse” -- a fundamental ministry, dedicated to presenting the Word of God without compromise. That ministry faithfully continues to this day." 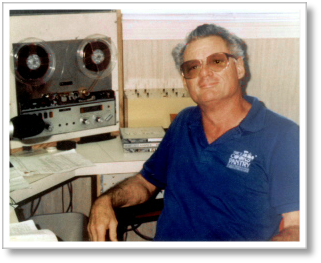 "In 1985, Aviation Radio Missionary Service, Inc asked us to prayerfully consider helping them to establish a new radio ministry in Grenada. After much prayer we agreed and in early 1986 we went on a fact-finding trip to Grenada to talk with the government and investigate possible sites for the radio station. We found the government officials very friendly and helpful. At that time the Lord clearly showed us that the station should be built on the small island of Carriacou, part of Grenada's tri-island state. 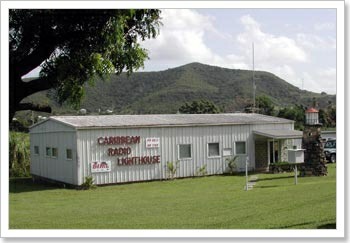 We began construction on the Harbour Light of the Windwards in 1990. The Lord worked many miracles to bring this about. When we first came to Carriacou we had no money to begin building and we had no idea where it could come from. But it was the Lord’s will for the Harbour Light to be here and He laid it on the hearts of His people to start sending funds."